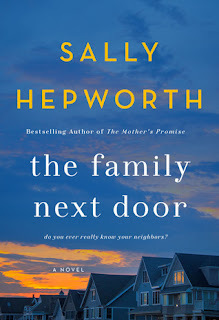 My thoughts: I have really become a fan of Sally Hepworth and her novels, having loved her last two books. They have been emotionally poignant tales about families that really tug at your heartstrings. Well...hold on to you hats because while this one is certainly about families - it has a bit of a different feel to it. It's more of a suspenseful tale, with some drama added to it - and I loved it!!! Right away, you become addicted to this book. It's told from multiple points of view and I think that helps make it not only engaging but it also adds to the suspense and drama. 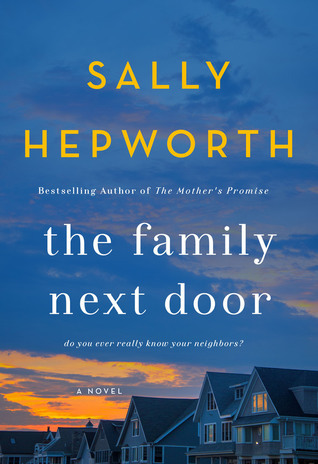 It's set in a small cul-de-sac where a new neighbor, Isabelle, has just moved it - but she doesn't quite fit the mold of the neighborhood and the ladies are definitely curious about her. As we begin to get to know each of the ladies, one thing becomes crystal clear...each one of them has secrets they are hiding. These women may put up the facade that everything in their lives is picture perfect, but nothing can be further from the truth. And when you factor in the mystery that surrounds the new neighbor and what really has brought her to their neighborhood, your mind goes into overdrive trying to figure it all out. I loved this book...I was consumed with it, not being able to think about anything else but these women, their families, and what really was going on. As each secret and back story was slowly revealed, I tried to figure out if it was part of why Isabelle is there. I tried to put it all together, but never got close to putting all the pieces together myself...this is so cleverly crafted. Nothing is as it seems and while it is suspenseful and full of drama, there still are those heart-tugging moments that Sally is known for. This is definitely a must-read book, in my opinion, and one that I would highly recommend! ***Be sure to visit my earlier post for a chance to win a copy of this book! Link is here.